Hali is the founder of the Asian Women Giving Circle, the nation’s first and largest group philanthropic vehicle for Asian American women. She has worked in many capacities, often combing the love of learning, the arts and social change. 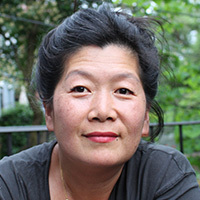 She is the former executive director of a domestic violence service provider, the Korean American Family Service Center, and has been a development director at progressive independent schools, including the Blue School. Hali has served on several boards, including the New York Women’s Foundation and the Korean American Family Service Center. Hali has spoken extensively about giving circles and group philanthropy, for example on a panel on Women in Philanthropy at the New York Times, Kellogg Foundation’s Cultures of Giving, at the Women’s Funding Network’s international conference, at Philanthropy New York, and at a recent National Summit for Family Philanthropy. Hali has been awarded for her exemplary leadership and activism in communities by the New York Women’s Foundation, Asian American Arts Alliance, and the New York Chinese Cultural Center. She graduated from Princeton University with a B.A., studied Buddhism at Mahidol University in Bangkok, and received an MSW from New York University. Hali immigrated to this wonderful country from Korea as an infant. She lives in Brooklyn, NY with her husband, three teenage children, and lots of pets, including several hives of bees.